Simply known worldwide as Nikon is the Nikon Corporation which is a Japanese multinational corporation with its headquarter in Tokyo, Japan. The company is mainly specialised in imaging and optic products. The different types of products offered by Nikon are; cameras, camera lenses, microscopes, binoculars, measurement instruments, ophthalmic instruments, rifle scopes, spotting scopes and steppers which are used in the photolithography of semiconductor fabrication. The Nikon operation had its start on 25 July 1917 when a comprehensive and full integrated optical company known as Nippon Kogaku came about thanks to the merge of three optical leading manufacturers. This growing company finally became a leading one in the manufacturing of optical lenses and also equipment which were used in cameras, microscopes, binoculars together with inspection equipment for the next 60 years. During World War 2, this company was of great help to the Japanese military as they manufactured bomb sights, periscopes, lenses and binoculars for military use. When the war was over, Nippon Kogaku returned to the production of products for its civilians. It was in 1948 that the first new brand Nikon camera was ever released. The American photo journalist David Douglas Duncan did highly contribute in popularising the Nikon lenses in America. From then, the company progressed with growing technology to the production of what we have today as Nikon cameras which are highly appreciated by many. The COOLPIX AW130 has been well designed and built to be ready for any kind of adventure you wish to take be it on the Earth surface or under water. This camera is waterproof, shockproof and freeze proof, so it can be taken around for different adventures. This camera comes with a built-in Wi-Fi and a Near Field Communication technology which permits you to immediately transfer your photos to a compatible smart phone or tablet. Your shots are being mapped and your coordinates are being recorded thanks to the built-in GPS it does come with. Being waterproof, shockproof and freezeproof, this is the Nikon tough camera. 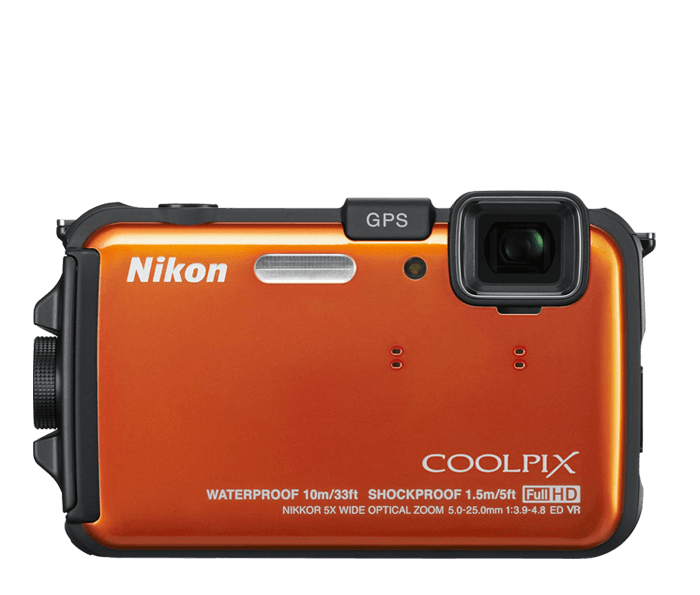 This Nikon waterproof camera can be taken for snorkelling, fishing or rafting without fear of bringing any damage to the camera. The Nikon tough camera is waterproof down to 100 feet. It is a camera which can be taken for snowboarding since it is freezeproof to 14 degrees Fahrenheit. There is just no problem taking this camera for biking and climbing as it can withstand shocks of up to 7 feet high without showing any signs of damage. This Nikon waterproof camera offers you the ability to quickly and easily send photos wirelessly from your Wi-Fi and NFC enabled COOLPIX AW130 to any compatible tablet or smartphone by using the wireless mobile utility app which makes part of modern camera technology. On the go you can share your great photos, even in remote locations you are offered the possibility of using your smartphone or tablet to control your camera. For creating amazing photo journals, it comes with mapping features, Built-in GPS, points of interest and an electronic compass. With this camera you are offered the possibility of relieving all the excitement of your travels in a new way. For the COOLPIX AW130 records the exact location of each shot you take thereby offering you the possibility of following the path of your adventure as you can share your journeys at Google Maps. With this camera you are able to navigate even unfamiliar paths thanks to the built-in mapping and electronic compass. The points of interest have been programmed to show you all nearby historic landmarks and scenic lookouts. This particular Nikon waterproof camera is the ultimate travel companion of travellers. The COOLPIX AW130 comes with a 5x optical zoom NIKKOR ED wide-angle glass lens for capturing any kind of stunning view. 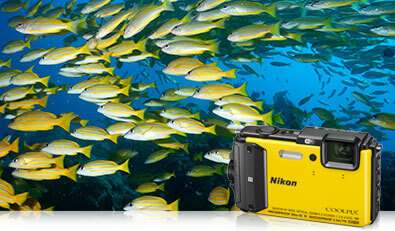 If it happens that you are underwater, you need not worry as this feature makes it an ideal Nikon underwater camera. Even if you happen to find yourself on a mountain, there is still nothing to worry about as this camera’s wide angle, 5x optical zoom NIKKOR glass lens has been designed in a way as to give you a clear and wide field of view which is ideal for such moments. A reason why so many people consider this as the best underwater Nikon camera. This camera comes with an anti-vibration feature aimed at reducing almost all camera shakes and hence makes your videos steadier and your photos sharper. 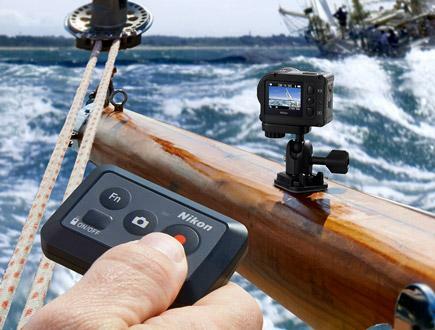 This feature makes this Nikon waterproof camera crucial for an action camera. This Nikon underwater camera offers the possibility of holding down the shutter button and firing up to 5 shots per second so as to allow you create amazing and beautiful action sequences with just a touch of a single button. With this Nikon tough camera, you will probably get views of fast moving objects, you simply hold down the shutter button and fire up to 5 shots per second. Out of your choice, by simply pressing a button, the COOLPIX AW130 becomes a high performance video camera which you might have never seen before. This Nikon tough camera comes with a 5-axis Hybrid Vibration Reduction which was designed and programed to help you shoot stable and smooth videos without a tripod. This camera comes with a built-in stereo mic which captures filtered sounds and eliminates wind action in the video sounds. This Nikon tough camera is one which shoots in Full HD. There is just nothing worse than a shaky handheld video. This Nikon waterproof digital camera is one which comes with Hybrid Vibration Reduction which activates itself immediately you start recording a video so as to combat camera shakes thus produce steadier movies. This Nikon tough camera comes with a wide viewing angle OLED display which makes it very easy to compose all your shots or even monitor your video recording for a better outcome. With this camera, reviewing and sharing your creation is a pleasure as each shot looks fantastic on the display. It is highly frustrating when a smart phone camera does focuses on the wrong thing, but such is not the case with the COOLPIX AW130, for it features the target finding AF which determines your intended subject in just less than no time. After it is done, it simply focuses on the subject itself to offer you an amazing photo of the subject. This Nikon tough camera provides great creativity at your fingertips. You simply need not worry even if your fingertips are enclosed in ski gloves for the COOLPIX AW130’s handy action makes it very easy to adjust specific camera settings of your choice. This Nikon tough camera is one which automatically changes its settings to suit subject targeting for an amazing photo shot, so even if you do not have the time to adjust settings, there is no problem. This camera offers you the possibility of adding creativity if you desire to, you can select-in camera effects like black and white or some other better selective colours. This underwater Nikon camera comes with an underwater mode which works in keeping all images colourful and properly exposed; a reason why so many people consider it the best Nikon underwater camera. Although labelled on the camera 100 feet, this Nikon underwater camera can handle with ease underwater depths of 98 feet for up to 60 minutes without showing the least signs of weakness. That is at least 50 feet deeper than most underwater cameras. In addition, this camera can handle a lot more than just a day at the beach. The camera’s depth of drop without damage being 7 feet is the highest depth compared to all other cameras. Being waterproof, shockproof and freezeproof this Nikon tough camera is ready for all kinds of extreme adventures. The AW100 has been designed and built to withstand extreme weather conditions, without being damaged. You can take it and dive to depths of 33 feet without any damage. Out of your wish you can take this camera for snowboarding since it has been designed and constructed to withstand temperatures of 14F. There is no need to fear when climbing or riding with this camera for it can withstand shocks of up to 5 feet without showing any signs of failure. This Nikon waterproof digital camera offers you the possibility of making Full HD movies of your choice for better entertainment and high quality images. This Nikon waterproof camera helps you see where you are going and mark the places you have been to. It comes with a built-in GPS, mapping and electronic compass. Just think for a second, you and a friend are all white-water rafting down an unfamiliar route. At such a point, this Nikon waterproof camera can take the pounding action while you take on recording movies and photos of this incredible adventure. With the Nikon View NX2 Software you can completely track progress. You are then offered the ability to view your path thanks to the built-in map. The electronic compass comes as an additional safety measure which is aimed at helping you ascertain which branch to take should in case there is fork in the stream. This Nikon waterproof camera comes with a 16.0 MP CMOS sensor which offers possibility of shooting even in very low light. In most of the cases, adventures do not always happen in most of the perfect photo taking conditions, a reason why this camera was designed and built to overcome this limitation which holds back so many different cameras. This camera has been designed to capture sharp and amazing photos at depths of up to 33 feet even when there is not sufficient light. With this Nikon waterproof camera, you can shoot up to 3 shots in just about a second by simply using one touch control to obtain Full HD movies there by ensuring that not even the least part of your action is missing. It comes alongside well designed and programmed features to filter air action and produce suitable and amazing sounds of high quality for your HD videos. This underwater Nikon camera comes with highly focusing power, it identifies the subject accurately more than the other types of cameras. Once after it has identified the subject, it focuses completely on the subject so as to provide you with high quality and clear photos even in areas with little light. So many people appreciate it for being waterproof, dustproof, freezeproof and shockproof. A good number of people appreciate it for always coming in neutral colours. It is a camera which fills a unique product niche. The handgrip of this underwater Nikon camera is less than ideal. It shows a poorly placed action mode control. The Nikon 1 AW1 possesses the full underwater capability of a rugged camera so it is efficient even at great depths below water. This amazing camera being unique in its domain is a great one for the adventure enthusiast. So many consumers around the world have greatly shown that they truly appreciate compact digital cameras that all combine the ease of a point and shoot together with the feature set of a DSLR. This camera provides an enhanced performance, the ability to swap lenses and better image quality. Even though it does not look like a compact P&S digicam nor does it look much like a DSLR, it is quite attractive. It somehow looks a little like a range finder camera coming from a different era and build in the old-school standard style. Even though this underwater Nikon camera comes with a metal-alloy stainless steel frame it does not feel heavy at all. This Nikon camera is not really pocketable but it always comes with a neck strap which will keep it close and secure at all times. This camera is waterproof up to depths of 49 feet making it an ideal camera for underwater adventurers. This Nikon tough camera was designed and constructed to withstand shocks coming from heights of 6.6 feet without showing the least signs of weakness. This Nikon tough camera has been designed to be shockproof. This camera is another one which is ideal if you enjoy snowboarding, for it has been constructed with a freezeproof of 14 degrees Fahrenheit. This Nikon waterproof camera is quite easy to use even in the hands of non-professionals. A reason why so many appreciate it much. The Nikon tough camera does provides a 14 megapixel resolution and allows without any inconvenience both JPEG and RAW image capture formats. This camera is in possession of a 3.1 inch 921k TFT LCD Monitor. In addition it records HD videos at 1920 x 1080p with stereo audio just as you would appreciate a tough camera to. This underwater Nikon camera is available in white, black, and silver versions. At an extra cost, Nikon offers protective skin for the camera. Depending on the seller, the Nikon 1 AW1 can be purchased between 800 dollars to 1000 dollars. A price worth its high quality features and efficiency with respect to most other cameras. This is a Nikon tough camera which you can take pictures and make high quality videos just as it pleases you and in a way that you will expect a high quality and efficient Nikon camera of present times to. In order to offer you images shot in Ultra HD it possesses dual lenses. With this camera at hand, you need not fear of the quality of your photos or videos being affected by moisture.This Nikon tough camera are shockproof and its durability is amazing. This is an ideal Nikon underwater camera since it is waterproof up to great depths 100 feet, thereby permitting underwater adventurers to go far deep as it would please them and still get amazing photos. This camera can be purchased for 499.99 dollars, a price worth its great features and durability. This Nikon underwater camera comes with an AA-14A Lens Protector and an AA-15A underwater lens protector aimed at offering you efficient photos even at great depths were lightning is very low. This Nikon waterproof digital camera also comes with an AA-17 Head-Mounted Display. In addition it comes with a CF-AA1 Silicone Jacket. This under water Nikon camera also comes with a warranty card and an owner’s manual aimed at assisting you master easily the use of the camera in an efficient way so you can benefit from all its great features. Nikon ML-L6 Remote Control feature permits you: to tag highlights from your videos, to start and stop capture pictures and recording videos remotely. The buttons size on the remote are made such that it can be manipulated comfortably even with your gloves in the winter. Nikon KeyMission accessory pack includes an extension arm, KeyMission tripod, a back up rechargeable EN-EL 12 lithium-ion battery (the same battery that comes with the camera) and the KeyMission System case. The standard socket connection for all the above listed accessories is also included with the camera. Additional accessories available separately such as helmet, suction mounts, wrist strap and chest harness. This will permit you to mount your camera any type of adventure gear you’re using. An AA-14B Lens protector and an AA-15B underwater Lens Protector. The Nikon lens can bend up to a maximum angle of 170 degree producing high quality videos, and still photos that are truly amazing to look at. The alternate capture modes such as time lapse and slow motion keeps your content and final video cuts look almost like an expert job. Furthermore, the rear LCD is large enough and bright, allowing you to update your videos and pictures accurately and easily operate in different modes and settings. It also comes with a warranty card and a User manual which is aimed at guiding its owner to profit fully from all the features offered by the Nikon waterproof digital camera. A warranty card and an owner’s manual. This is an ideal camera designed to withstand all what your family throws at it and at the end show no signs of damage or weakness. This Nikon tough camera is waterproof, shockproof, freezeproof and dustproof thus ideal for snowboarding, beach, skiing amusement parks together with some other bumpy adventures you can take your family to. Not just being very easy to use it also comes with oversized buttons meaning each and every one can have their own turn taking photos and ultimate HD videos. Right in the camera, you have the possibility of creating fun slideshows with sounds. This Nikon waterproof digital camera stands for non-stop family joy, fun and happiness. This is an ideal underwater Nikon camera as it can go down to depths of 33 feet underwater without showing any signs of weakness or even getting damage. This makes it suitable for underwater adventurers. So many underwater adventurers have highly rated this camera as the best choice for them, since it offers great focus even at great depths thereby providing them with clear and amazing photos. With this tough camera at hand, you need not fear or worry climbing or be disturbed if the camera unintentionally slides and fall for it is shockproof to depths of up to 5 feet. This camera was designed in such a way that you can play with it in the snow or simply accompany the children play in the snow while taking their photos and making videos without fear of it being damaged. This is because it can resist temperatures as cold as 14 degrees Fahrenheit. This camera is in complete safety to be taken to any place where the family can go be it in the beach, playground, pool with which you can be completely sure of getting great shots. With just a single touch of a button coming from you, this Nikon tough camera becomes a versatile HD video camera. You are offered the possibility to add fun effects to your images like miniature as you eventually make an entire scene look just as a toy model. Once that has been done, you can simply connect to an HDTV with the optional HDMI cable so as to enjoy those amazing videos and photos with the whole family. COOLPIX S33 does creates truly exceptional photos together with ultimate full HD 1080p videos. This Nikon waterproof digital camera comes with a very high performance NIKKOR glass lens which is paired with a 13.3 megapixel CMOS. This is a low light image sensor aimed at yielding superior image quality, low light-performance and versatility. Shots from this camera will impress you very much. This Nikon underwater camera offers you the possibility of flattering your friends and family as it allows you create beautiful photos of the people you care about. It comes with a smart portrait system which does activate several features ideal for portraits like skin softening, face priority, and smile timer. This underwater Nikon camera comes with a new underwater face framing feature which is out to ease photo shots of people underwater. Due to the fact that this Nikon waterproof camera is very easy to use, just any one can shoot great and amazing photos with it and also make great HD videos without some particular expertise in the domain. For the best shot possible at any subject, you simply need to select Easy Auto Mode and the camera will adjust the settings required automatically so as to produce the best. With this camera, just each and every one can have a turn using the camera due to its simplicity. With this camera, you do not really need to make any major settings to obtain great shots as this is done automatically for you. The oversized buttons of this camera are friendly without exception. With this camera, you simply need to point, shoot and allow the camera do the rest for you, a feature which is not found in all cameras. This is so because this camera was designed with the whole family in mind from children to parents without any exceptions. This Nikon waterproof camera is one which turns the ordinary into extraordinary without posing any major issues. With this camera you can easily and simply apply creative image effects and fun like miniature, selective colour, and skin softening from the camera so as to obtain the best out of your photos and HD videos. This is done if desired at the spot and just immediately after the photo has been shot, thus with this camera, there is just no need for a photo editing software at all. One problem which has been faced over time in shooting photos has to do with shots of moving objects. But this Nikon waterproof digital camera comes with great features aimed at resolving this problem and providing you with sharper photos of moving subjects. Once you have point the camera at a subject ready for shooting, if it happens that the subject is fast moving the camera automatically detects and immediately kicks in as it chooses a faster shutter speed. It also automatically takes on a higher light sensitivity feature so as to provide you with clearer and sharper photos which you will obviously not get from most of the cameras out there. This Nikon waterproof digital camera is marketed more as a family camera. It is generally referred to as a family camera due to its simple design which makes it very easy to use and operate by kids without facing any difficulties. This camera comes as waterproof to up depths of 8.9 feet. In addition this camera is also shockproof to heights up to 2.6 feet meaning if it happens to slide off your hands unintentional you can still pick it up intact without any damage. This camera comes alongside a respectable 10.1 MP resolution which always bring forth acceptable and amazing images which are similar to those taken with a camera phone. Hue, brightness and vividness can be adjusted thanks to the sliders which come included from Nikon. The S30 is not recommended for anything apart from picture taking in bright light or outdoor light. This is because the camera does not perform well in low light conditions and if used in low light conditions it can provide low quality pictures. The quality of the videos produced by this Nikon waterproof digital camera is excellent if you are only looking out to share and watch these videos amongst family and friends. This camera comes with a 3x optical zoom, it permits you record videos in HD 720p. This camera operates with an AA batteries. It uses an SD memory card for the storage of all your pictures and videos. 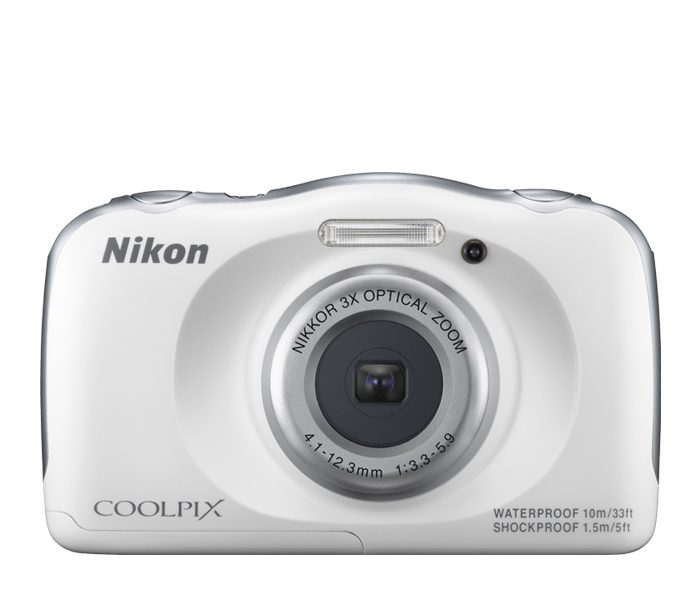 This Nikon Coolpix S30 digital camera is one which is less expensive when compared to the others. This camera stands out as a family oriented waterproof digital camera which is designed to be best used outdoors in good lightning conditions. It produces efficient results for slow moving and stationary subjects. With the S30 you are offered the possibility of creating photos and movies underwater down to 9.8 feet, and the pictures and videos at this depth remain amazing ones. The S30 can withstand all drops moving up to 2.6 feet. This Nikon camera allows just for one touch button recording. The videos and images obtained thanks to this camera can be uploaded to the web where you can share with family and friends for fun and pleasure. This Nikon waterproof digital camera has been designed in such a way that it automatically takes a shot. With the easy slide show mode you can instantly review all your pictures and movies if you desire to. If you wish you can simply select playback effects so as to choose music to accompany slideshow. To ensure that you obtain sharper and clearer images, the electronic VR image stabilization minimises all effects of camera shakes during the shooting process. The camera comes with great fun options which are designed to appeal the kids. This camera is very simple and easy to use, it takes amazing pictures and it remains a great camera for the price. It comes with a centred flash which highly decreases the chances of having it covered accidentally by the finger. This camera comes with kid friendly features such as the placement of the shutter. The camera cannot be used in doors or in lowlight conditions, for in such conditions, it will only offer poor images and videos. The sound produced by this camera is muffled. The sharpness level in video recording is ok but not great. Science of Sleeping Bags and What Type Of Sleeping Bag is Good for You?